Not sure if you are in the right place? See the article, 'Troubleshooting Garage Door Problems' for more information. The garage door pulls away from the jamb as it opens. It needs something to snug up to when it closes. Additionally, the bottom of the garage door is resting a floor that may not be perfect. There is another seal along the bottom of the door that keeps the air out. In the middle of winter it can be very cold air. Take a little time and fix up your garage door weatherstripping. It's not that hard and it will save you money. This is not a difficult job for a service man. Completely replacing the weatherstripping for your garage door could involve $50 to $75 in material. Add to that another $50 to $75 in labor. In this case you will mostly just save the labor. You will need to buy the replacement material when you do it yourself. Working with garage door weatherstripping is not that difficult. 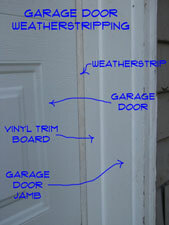 Weatherstripping is simple. For garage doors, it is not adjustable. When it goes bad, you just have to replace it. Not getting the job done could leave you with a door that leaks a lot more air than it did before. The door will still work, but your heating bills will go up. Replace top and side weatherstripping on a garage door when you notice gaps or air leaking in. Replacing the top and side weatherstripping keeps cold or hot air from blowing in around the edges of the door. Even if the garage is not conditioned, it still makes sense to conserve as much heat or cooling as possible. Over time the key feature of the weatherstripping may dry out, become damaged or be missing. When this happens it is best to replace the entire piece of trim. Use a flat pry bar to carefully remove the damaged section of trim. Pull out the nails and clean up the surface. Obtain a new piece of trim. Get vinyl, no painting. You will need to use a miter box to cut it to length. Close the door and make sure the new piece fits snugly against the door. Mark it with a pencil. The old trim may have been a different size and using the old line may not work. Use galvanized finish nails or plated screws to install it. With the new piece of trim in place, check the operation of the garage door. Does it fit against the weatherstrip when it is closed? Yes, well, good, you're done. Replacing the bottom boot on your garage door is needed when you see light under your door. Cold or hot air blowing in below your door is also a sign of a defective weatherstripping boot. Two situations here. You should have an aluminum track that the rubber boot slides in and out of. Common widths for garage doors are 8', 9', 10', 12', 16' and 18'. Measure your door to get the proper length. Working on the boot is probably best done with the door up. Slide the old boot out and take a piece with you to obtain a replacement. Slide it in place and trim off the excess. It may take a little patience to slide the boot into place, take your time, it will be fine. Older doors may have the rubber boot screwed directly into the door. If this is the case you will want to obtain a kit that has a track and new boot. Raise the door to work on the boot. Remove the old boot and clean up the bottom of the door. Obtain a replacement kit for your width of door. Use the screws provided to fasten the track to the bottom of the door. Slide the new boot into place and trim it with a utility knife. That's all there is to it. Repairing garage door weatherstripping usually means replacing it. Sorry, nothing lasts forever. Granite lasts a long time, still not forever. Your weatherstripping is not in the same league as granite, sorry. It is not too difficult and we hope you were successful. The parts for this job are a little expensive, but well worth it when weighed against your heating bills. You may be thinking that you are not heating your garage. When it is attached to your house it is a transitional zone. That cold air matters.